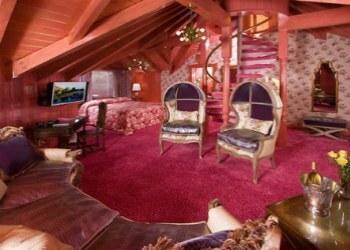 The Madonna Inn is a motel in San Luis Obispo, California that opened over 50 years ago. This inn quickly became a landmark on the Central Coast of California. The Inn was created by Alex Madonna, a successful construction magnate and entrepreneur, and his wife Phyllis. The well-known motor inn, which includes a restaurant and bakery, is prominently located on the west side of US Route 101 and situated on the lower eastern portion of Cerro San Luis Obispo. The property is adorned with a pseudo-Swiss-Alps exterior and lavish common rooms accented by pink roses, Western murals, and hammered copper. 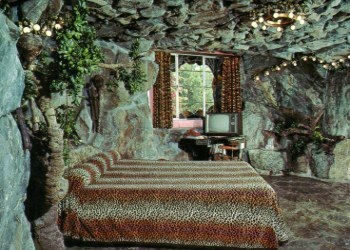 Each of the 110 guest rooms and suites is uniquely designed and themed, though some tourists stop just to peek at the famous rock waterfall urinal located in the men's restroom, a feature designed by Hollywood set designer Harvey Allen Warren. The first 12 rooms were completed December 24, 1958, and were given complementary for that night�s stay, to a very surprised group of travelers. 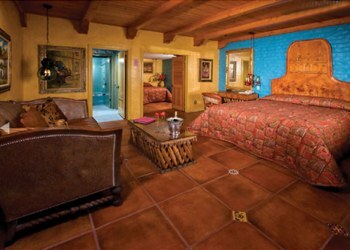 An additional 28 rooms were quickly built, making a total of 40 rooms available to travelers. Demand for public areas to handle the rooms encouraged us in April 1960 to start construction of the main inn, which was to eventually consists of the wine cellar, bakery, coffee shop, dining room, the cocktail lounge, banquet rooms, ladies� boutique, men�s gift shop, and the gourmet shop. One hundred ten unique rooms now exist, each decorated differently to suit many individual tastes...rock rooms, waterfall showers, rock fireplaces, European fixtures, and fine furnishings to name a few. 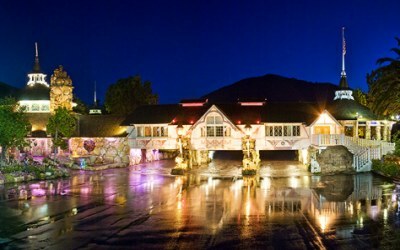 The Madonna Inn sits on approximately 2,200 acres and the large rocks used in the construction came from these surrounding acres. Some of the larger rocks weigh in excess of 200 tons each. The leaded glass work throughout Madonna Inn and the large etched glass windows in the coffee shop, almost things of the past, were custom made for the Inn. The leaded glass inserts in the windowed area facing the large fireplace are of particular interest, since each insert illustrates one of the various Madonna enterprises: construction, lumber and cattle. The hand-carved marble balustrade in the Gold Rush dining room came from the Hearst Castle. All copper and brass items were etched and/or shaped from original designs and fabricated right on the premises. The 28-foot gold tree fixture in the main dining room was made from electrical conduit left over from building projects as well as from left over remnants of copper. Several wood carvers were brought in for the specialty work of hand carving the doors, beams, railings and the many other carved adornments you see here at the Madonna Inn.